Being a person with a right above knee amputation myself, I understand the challenges kids and parents are faced with every day. I became a Peer Support Volunteer because I want to help people with limb differences and parents. I believe by sharing my own personal experiences of growing up with a limb difference is the best way to help others. I have a lot of experience with prosthetics and I have been wearing a prosthetic leg for about 16 years now. I am currently employed as a Prosthetic and Orthotic Technician and have been making prosthetics and orthotics for about 12 years. 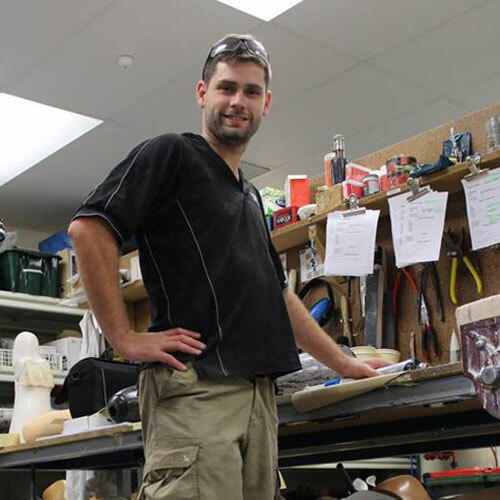 In 2017 I will be studying for a Masters in Prosthetics and Orthotics at La Trobe University. I had a motor vehicle accident in 1994 when I was nine years old which resulted in six years involving over 250 operations to try to reconstruct my right leg. Because of the lack of functionality in my right leg I decided to have my leg amputated above the knee in 2000 when I was 15. I made the decision with the support of my family and was ready to begin my new life as a person with an amputation. I only spent six weeks in hospital after the amputation and I was handed my first prosthesis, and walked out of hospital forever. I believe what is most valuable about the role of being a Peer Support Volunteer is the ability to share your experiences. It is invaluable to be able to respond to answers and give hope to people living with limb differences as well as to their family members. I believe that by providing peer support I can help others to see their own potential. Having a limb difference myself has not been an issue for me. I believe all you need is the courage to reach your potential and the determination to fulfill your goals. I enjoy sharing my experiences with children with limb differences and their families and I hope that my story and journey will provide them with an opportunity to ask questions. I am passionate about showing others who live with or support people with limb difference that it’s possible to live life to your full potential.